September 22nd was Goro's anniversary! Oh so sweet Daddy's boy. Naughty Goro always tries to ambush Niko. But he is such a good boy. House Rule: Good cat gets a snack! for Goro's Gotcha Day snack. 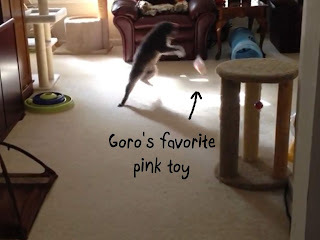 Here you go, Goro. Enjoy! Happy 9th Gotcha Day, Goro!! We are so glad you came into our life. Happy Gotcha day good boy. Have a great day. Purrs from Skipper. Happy Birthday, sweet Goro! Did you adopt him when he was a kitten? So his real age is close to 9? I love your ambush shot. And playing with his toy, you captured all four paws off the ground! Happy 9th Gotcha Day, Goro! You are adorable, and you lay on the ground just like Manny; your front half going one way, the back half another! Happy birthday, dear Goro! You are such a handsome, cute and lovable boy! Love the picture with you daddy ♥. The chicken cake your mom made looks soo yummy. Happy Gotcha Day! You adopted a really great home. And your mom actually cooks for you. How awesome is that? Happy Gotcha Day, Goro!!! We hope you have a wonderful day celebrating nine wonderful years. Love the photos of you and especially the one of you with your dad. Have fun today. Thanks for the share. Happy Gotcha Day Goro, I see it was a special one! Happy 9th Gotcha Day Goro!! WE love that you are so appreciated and loved. Happy Gotcha Day, Goro! Looks like you celebrated in style! All I want to do is give him a big cuddle. Your cate looks so gud did you share with Niko ? You are so lucky to have such a gud mum and daddy. I love his sweet face with daddy ! Happy 9th gotcha day to Goro! Love these precious photos of him, especially the one in the box, presenting himself as a 'GIFT' and his favorite pink toy. The photo with his Daddy is the WINNER! Happy gotcha day, Goro! Your human makes the best celebration treats! I think I have a girl for Goro ! I can't tell you how much I LOVE seeing your sweet cats. They are just precious, my friend, and they have the cutest personalities :) Happy 9th Anniversary to sweet Goro! Hugs to you, dear Tamago! Happy Gotcha Day. Goro-Chan. We look forward to many more years of your and Niko's adventures! Happy happy day!! You are indeed a handsome boy and deserve all possible spoiling!! I would love to rub that belly! Happy gotcha day, Goro-Chan! You are handsome, sweet and a good boy. Oh, and you gotcha'd the best home ever. Love and hugs! He's so cute and adorable. Happy gotcha day ! You are a very pretty cat ! Never seen such a beautiful cake, my slave is too lazy to do cakes for us ! Awww, what a cutie. Happy Gotcha Day, Goro! enjoy day for Goro san with cakes. Happy Anniversary Goro. Looks like you had a good day with some terrific snacks. I never realized you had a white place on your neck. You all have a great day. Happy Belated Gotcha Day Goro! Just stopping by to admire handsome Goro! I love to see his happy life and that white blaze on his chest. Surely the mark of a Super Cat. Happy belated birthday sweet Goro! Just wanted to tell you that I don't get any emails anymore ! Have to see who commented on Blogger comment list ! Hope I can find a solution. The French cake indeed was a catastrophe, but we had a lot to laugh about it. My dear buddy Goro, sorry to have missed your Gotcha Day. What a special "cake" your Mom made you, glad you had such an awesome celebration, we love you lots! We are so happy you have such a happy home and life with an amazing Mom & Dad and brother!